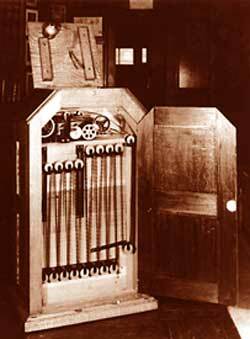 The age of motion pictures – or movies (“moving pictures”) – began at the end of the nineteenth century with the invention – and patenting – of a device called a Kinetoscope, an early motion picture exhibition device designed for films to be viewed individually through the window of a cabinet housing its components. This device was conceptualized by Thomas Edison and developed by his employee, William Kennedy Laurie Dickson, in 1890. The Kinetoscope allowed a series of transparencies to be recorded sequentially onto a single strip of negative film. Once this film was developed, printed and replayed at original recording speed, it created the illusion of moving pictures. Once the technology was perfected, business-minded men pounced upon it like sharks on a sea lion, opening nickelodeons – the first type of indoor exhibition space dedicated to showing projected motion pictures with the Kinetoscope (usually set up in converted storefronts, these small, simple theaters charged five cents for admission, thus the name) – across the United States. A third of these businessmen – being the smart sharks that they were – pilfered Edison’s work and built “Kinetoscopes” of their own. Patent laws and other such inconvenient balderdash be damned! Another third – being the not-so-smart, but gangsta, sharks that they were – stole Edison’s equipment and set up shop. The remaining third – being the wiser-than-their-brethren sharks that they were – actually purchased the equipment legally and in strict adherence to U.S. patent laws. Edison took everyone who violated his patent to court and won every suit – being the relentless and ruthless shark hunter that he was. The up-and-coming sharks – all based on the East Coast, within a seashell’s throw of Edison’s lawyers – figured, correctly, that being so close, they would only be caught and jailed, or fined heavily, if they pilfered from old Tom Alva. So, the sharks fled the East Coast and swam west to avoid scrutiny by Edison’s agents, or by government officials. Since sunny California was as far west as they could travel and still be in the good old U.S. of A, that is where most of the sharks permanently set up shop. This “second gold rush” led to a flood of silent movies pouring out of California. These films were the work of such men as Cecil B. DeMille; Adolph Zukor, founder of Paramount; and William Fox, founder of what is now Twentieth Century Fox. Since most of California was still undeveloped at that time, most of the films made in the wild, wild, west were, well…westerns. Filmmakers who created westerns had no need for elaborate sets. They only needed a couple of horses, a couple of stars – one, tin; the other, a celebrity who earned a whopping five dollars per film – a doe-eyed damsel in distress, some open land and a hill or two. Many filmmakers simply purchased a vacant lot, erected a few rudimentary sets – which they recycled from movie to movie – and called it a studio. To this day, film studios are still called lots – a carryover from their humble beginnings. Today, this American art form, born during the Age of Steam, is now being used to give birth to films set in America during the same era – uniquely American Steampunk movies. Released June 22 worldwide, Abraham Lincoln: Vampire Hunter opened third in the box office behind two animated movies – Brave and Madagascar 3: Europe’s Most Wanted (just can’t compete with the kiddy movies, unless you’re the Dark Knight or the Amazing Spider-Man). And if you just cannot get enough of Abraham Lincoln offing the undead, check out Abraham Lincoln vs. Zombies. If you can stay awake, you just might enjoy a chuckle or two. On the (shark) tails of ol’ bloodsucker stakin’, walking dead decapitatin’, “Honest” Abe comes the short, Steamfunk film, Rite of Passage: Initiation – written and directed by Yours Truly, based on the story Rite of Passage, by author Milton J. Davis – which, if I may say so myself, is Blacknificent! 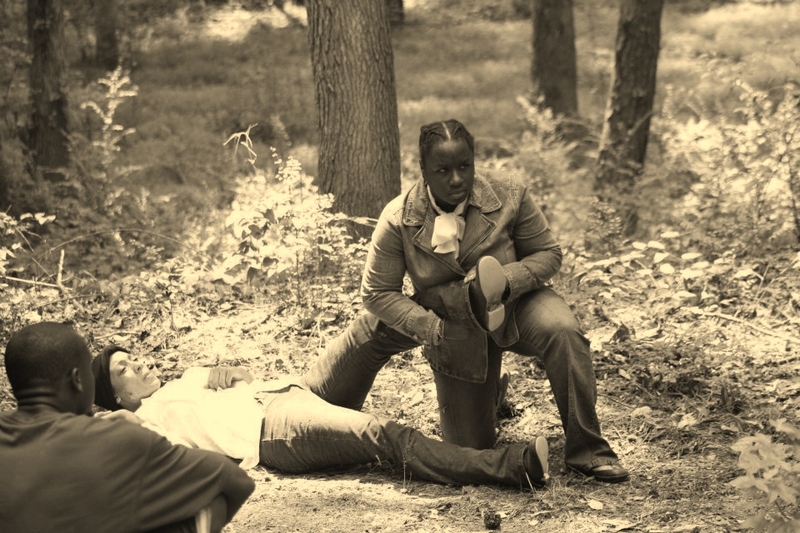 What makes this film so awesome is the genius of the actors – Dasie Thames and Iyalogun-Osun Ojetade (yep, we’re related – she’s my wife) who were not only incredible thespians, but performed all their own stunts and fight scenes. People will never see Harriet Tubman the same. This film is chock full o’ genius, as is indicated by the brilliant work of cinematographer Imed “Kunle” Patman and camera operator, Brandon Lamar Davis. These extraordinary gentlemen made me look good and made my job easy. They both have a great eye for action and Mr. Patman brought his experience and mega-talent as both a cinematographer and an editor to the film. Not to be outdone, Alana Davis – our photographer took some amazing shots of the action and drama and our composer – Dion Wake – produced a powerful score that is part Ennio Morricone (the Good, the Bad and the Ugly; A Fistful of Dollars), part Benny Carter (Buck and the Preacher) and part Mario Paint (Gonna Fly Now / Rocky’s Theme; Eye of the Tiger). Finally, Co-Producer, Milton Davis, our Associate Producer – Danny “Akin” Donaldson – and Gabriel Adeyeye, our Boom Operator, helped raise Rite of Passage: Initiation to a level of creativity, power and beauty beyond my wildest expectations. 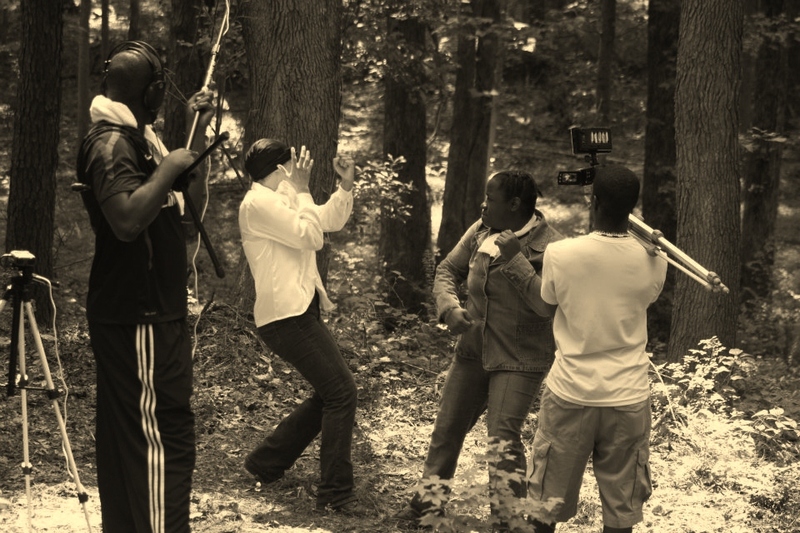 After we premiere Rite of Passage: Initiation on August 4 at the State of Black Science Fiction Film Festival (for more on the film festival, check out https://chroniclesofharriet.com/2012/05/31/adapting-stories-into-screenplays-and-a-brief-history-of-the-first-steamfunk-movie-video/), we will raise funds to shoot Rite of Passage as a five episode series and then either present it as a web series or pitch it as a series to a few local television channels. Our goal is to bring quality, entertaining Steamfunk into homes worldwide. Expect no less. Posted by Balogun on June 27, 2012 in Adventure, atlanta, Dark Fantasy, Fantasy, Harriet Tubman, Historical Fiction, Martial Arts, Science Fiction, Short Story, Speculative Fiction, Steampunk, Uncategorized and tagged abraham lincoln, age of steam, balogun, black speculative fiction, dasie thames, fantasy, film festival, harriet tubman, iyalogun, milton davis, rite of passage, science fiction, slavery, steamfunk, steampunk, underground railroad. I’m honored to be a part of this project. We’re starting a movement! I am honored to be a part of this with you and the team. So much brilliance! First, congrats! I think it’s wonderful, the work you’ve put into making this movement move and it not be a “stayment” or a “flap-your-jibs-complainingment” if ya dig me. I for one am tired of seeing new shows come to network television and cable with the same white guy/woman saves the world w/a Black or Asian sidekick in tow. Now don’t get me wrong, there are some VERY good shows coming out on televison. But with statistics pointing at the fact that in the next 15 to 20 years America will be brown, the rest of the world make up people of color – how the hell do you tell dystopian stories with little or NO colored folks in them? During the Victorian Age and before Africans had a tremendous effect on the history of Europe (even Shakespeare knew that) yet these “Period Pieces” conveniently leave that part out – unless Africans are slaves. You guys go and get your stuff on TV. There should be no reason we can’t see it – unless it’s horrible. Nope, that’s not a reason because I watch TV and I see some ragged BS on it every day! Look, how many stations are going to carry Martin, The Cosby Show, and Goodtimes before enough is a damn NUFF! Thanks, so much, for your comment. I, too, tire of seeing us in powerless, subordinate roles and I am working hard to change that. I do not want to just bring Steamfunk to television and th big screen…I want to – and will – bring GREAT Steamfunk to television and the big screen!